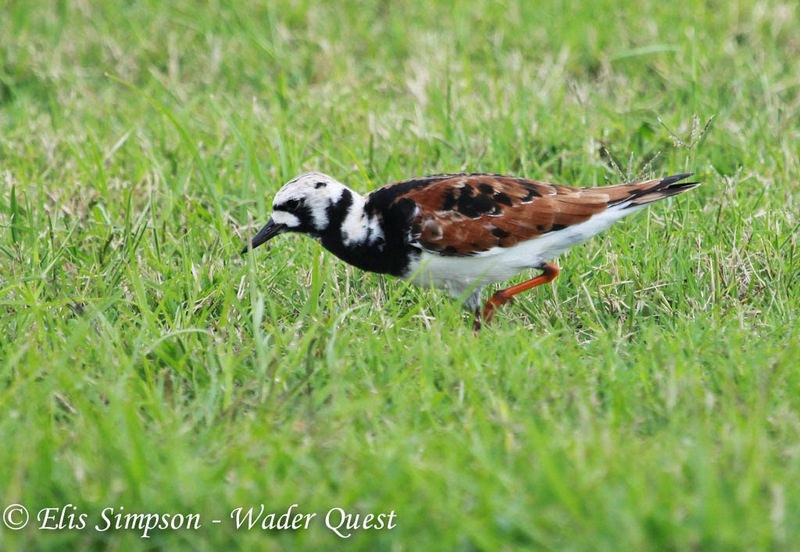 Wader Quest: Galveston's oil spill and the birds that could be affected. Galveston's oil spill and the birds that could be affected. Last April we had the immense privilege to attend the Louisiana Ornithological Society's weekend at Cameron in Louisiana and were given the opportunity to give a talk to the attending members. We also spent a couple of days in Rice Country where there was an impressive number of waders to be seen. On that trip we saw an impressive 34 species of wader including most of those that travel between the two continents with the lamentable exception of Eskimo Curlew. Long-billed Dowitchers Limnodromus scolopaceus and Stilt Sandpipers Calidris himantopus: Rice Country, Louisiana, USA April 2013. This is part of a large flock that flew in to feed after a short but sever thnderstorm with torrential rain. At the beginning and end of the trip we spent some time at Galveston where we really enjoyed the beach birding. The recent news about the oil spill in Galveston Bay has worried us as we think about the lovely places we visited and the birds we saw there all of which this year, whether migrants, residents or wintering birds, face the additional peril of the pollution; whilst an oil spill is never anything but a disaster, in terms of the migrating birds, the timing of this incident is very bad as thousands, if not millions of birds prepare to pass through there on their way north. Some of the birds that will be in the firing line as it were are those that are habitual beach users. Grey Plovers or Black-bellied Plover as they are known in the US are to be found on the open sand and some of the tidal marshes that are also under threat, along with their smaller relative the Semipalmated Plover. Grey or Black-bellied Plover Pluvialis squatarola; Galveston, Texas, USA. April 2013. Semipalmated Plover Charadrius semipalmatus; Galveston, Texas, USA. April 2013. Killdeers are resident as well as migrant and some, like this one we found, will breed. Killdeer Charadrius vociferus; Galveston, Texas, USA. April 2013. Killdeer chick; Galveston, Texas, USA. April 2013. 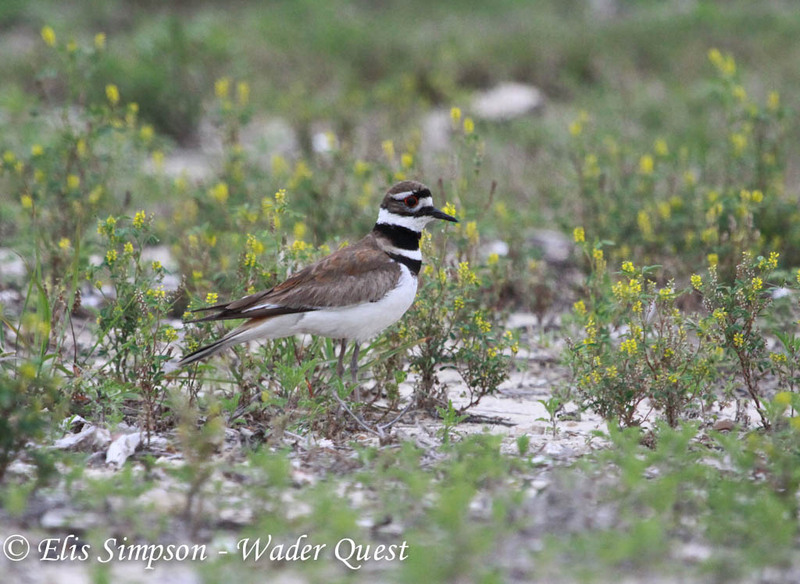 Wilson's Plovers are also breeding birds in the northern Gulf. Wilson's Plover Charadrius wilsonia; Galveston, Texas, USA. April 2013. These American Avocets will be wintering in the area but will not breed, they will move further north, probably to the Atlantic coast but possibly to the central west of the USA. American Avocet Recurvirostra americana; Galveston, Texas, USA. April 2013. Calidris Sandpipers that we saw there are represented in this group of at risk waders by Dunlin, Sanderling, Stilt Sandpiper and Least Sandpiper. The Dunlin's are of the subspecies Calidris alpina hudsonia and they have very long bills. Dunlin Calidris alpina hudsonia; Galveston, Texas, USA. April 2013. This Sanderling was on the beach and had found something rotting in the sand which was attracting lots of flies, a veritable smorgasbord for this bird which unusually was on its own. Sanderling Calidris alba; Galveston, Texas, USA. April 2013. Stilt Sandpipers were uncommmon and we saw just one at the coast, this one had been feeding with a small group of Short-billed Dowitchers. The Stilt Sandpipers will be on their way up to the high Arctic tundra in northern Canada and Alaska to breed. Stilt Sandpiper Calidris himantopus; Galveston, Texas, USA. April 2013. The Least Sandpipers were incredibly confiding, if you stood still they would walk right up to you allowing for some very intimate moments with these tiny birds. Least Sandpiper Caldris minutella; Galveston, Texas, USA. April 2013. Some Short-billed Dowitchers were in breeding plumage and looked lovely as they slept in the morning light. The bird on the right is probably of the nominate race Limnodromus griseus griseus showing white on the belly and undertail, the bird on the left could be of the other race that can occurs in the same coastal area, hendersoni, which has rufous running right down to the undertail. Short-billed Dowitcher Limnodronus scolpacea; Galveston, Texas, USA. April 2013. Hudsonian Whimbrels are quite common and every one reminded us that this was the last place an example of the Eskimo Curlew had been photographed, so we checked each one carefully just in case. Imagine what finding an Eskimo Curlew would have done for Wader Quest's profile (we can but dream). Hudsonian Whimbrel Numenius hudsonicus; Galveston, Texas, USA. April 2013. The Tringas were well represented too with both Greater and Lesser Yellowlegs being seen. Greater Yellowlegs Tringa melanoleuca (behind) and Lesser yellowlegs Tringa flavipes; Galveston, Texas, USA. April 2013. A fine chance to see the two together for comparison. There were also willets. Both Eastern and Western were seen and many that we couldn't be sure of, telling them apart is not easy but the bill shape and structure is a good indicator. This one has a broad and straight solid looking bill and is heavily marked so we adjudged this to be an Eastern Willet. Eastern Willets leave North America altogether and when they return they are in breeding plumage as this one is, the result being that they are not seen in North America in non-breeding plumage (R. Chandler 2009). Eastern Willet Tringa semipalmata; Galveston, Texas, USA. April 2013. Western Willet Tringa inornata; Galveston, Texas, USA. April 2013. Note: this individual is less well marked than the previous bird and has a less heavy looking bill (although the bill looks straight here in some individuals it can show a very slight upward curve). I'm not sure if this is diagnostic or not but the colour at the base of the bill is brownish in the eastern and bluish in the western. More colourful than the previous species are the Ruddy Turnstones, these are of the morinella race. These tend to be whiter on the head than the nominate race and have more chestnut colouring on the upperparts making them a truly delightful bird to behold. Ruddy Turnstone Arenaria interpres morinella; Galveston, Texas, USA. April 2013. One surprise for us was the Wilson's Phalarope that we caught running around like a sandpiper on the sand, we saw many of them in sometimes quite large flocks in the the rice country, but this was a solitary individual. Wilson's Phalarope Phalaropus tricolor; Galveston, Texas, USA. April 2013. All of these birds and many more besides will be at risk of death due to the oil spill, we know that many groups are working hard to clean up the mess, among them Audubon Texas, and Wader Quest was happy to make a donation to their emergency fund. Good luck to all those involved.